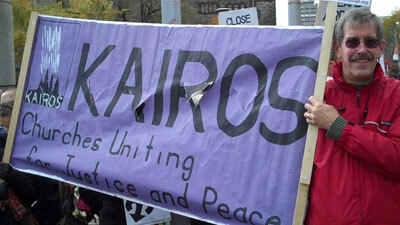 KAIROS is a Canadian NGO which, among other things, provides international assistance and does human rights work in Sudan, the Democratic Republic of Congo and Central America. It is internationally recognized and respected and, either directly or through its predecessors, has been receiving federal funding since 1973. On Monday, KAIROS found out via a brief phone call from CIDA (Canadian International Development Agency) that their long-standing and effective partnership with the federal government had come to a sudden end. No specific reason was given. Later this week, a KAIROS delegation is to travel to the United Nations climate change conference in Copenhagen to help lobby for an agreement that would include substantial cuts to greenhouse gas emissions. Last May, a KAIROS delegation toured Alberta’s oil sands region to see how massive projects are affecting aboriginal people and to determine if the operations are environmentally sustainable. The group met separately with officials from the four main federal parties in Ottawa last week and called for greater action on climate change and for a halt to new oil sands projects. â€œWe basically told our concerns about climate change and we thought it would be important for Canada to be represented [in Copenhagen],â€ Ms. Corkery said. Last year, KAIROS published a position paper that questioned the amount of taxes Ottawa allows the oil sands industry to defer on the capital cost of projects. The KAIROS contract that just expired received a positive audit and excellent CIDA evaluation this year. KAIROS submitted its new program proposal for 2009-2013 to CIDA in March 2009. It went through a lengthy approval process within CIDA up until the Minister’s level and has been waiting for approval from the Minister since July 2009. In other words, this could be a shot across the bow for other NGOs as well: Canada only has one party line now, and it must be toed. In my opinion it would be a good use of your time to contact Bev Oda (full contact info, or send her an email) to ask her why this decision was made with such little ceremony (KAIROS Executive Director Mary Corkery writes, “I know of no precedent for the Canadian International Development Agency ending a decades-long funding relationship with a major Canadian organization without notice in writing, with no reason and no transition plan“) and, if you oppose the decision, tell her so. It wouldn’t hurt to write or email your MP as well. The folks at KAIROS would appreciate it if you would CC your correspondence to them as well. Thanks so much. Last Tuesday at the St. Lawrence debate I was very excited to announce a major policy initiative called GROW Housing Toronto. 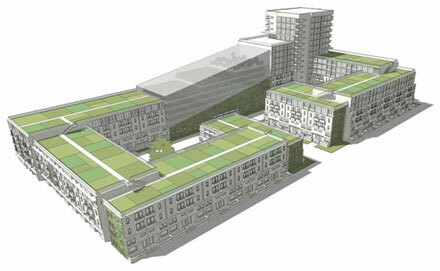 The plan would see the Moss Park Armoury replaced with an inspiring development that provides not only new affordable housing (based on proven mixed-income, rent-to-own and co-operative models), but also generates power, grows food and creates jobs. Even though the proposal is in a “conceptual” stage, many experts have contributed to GROW Housing’s design and, while not all of the details have been finalized, many have. Here’s the video of the announcement. â€œItâ€™s tempting to let cynicism sink in,â€ says Green candidate Chris Tindal. â€œBecause these are just words.â€ Recently noting that the number of news stories regarding his hair (one) exceeded the number of news stories regarding his platform (zero), Tindal shows off something practical: GROW Housing Toronto, a design to replace Moss Park Armoury at Jarvis and Queen with affordable residences that fulfill urban environmental fantasies â€” including a Vertical Farm. The conversation keeps veering away from the local, though, but Rae manages to reel it back by expressing how more people across Canada migrating to cities will be even more of a challenge than the immigration of a previous era. Tindal is pleased to hear Liberal talk of an environmental tax shift, noting there was no such discussion by Bill Graham when Tindal last did this election schtick in 2006. But thereâ€™s a bit less Rae worship from Tindal this time around, pointing out that heâ€™s the only candidate on the St. Lawrence Centre stage that was there for the previous federal election. â€œWe are hearing that people should vote Liberal to stop the scary spectre of Stephen Harper when you know this is a by-election,â€ snipes Tindal. â€œThe fact is, the Conservatives have no chance of winning â€” the best Don Meredith can say is that he believes in miracles. Youâ€™re slipping into the politics of fear, and I think there are more options than that. Tindal also used his personal blog to refute Raeâ€™s assertion that there arenâ€™t Canadian military officers serving in Iraq as part of the American command, and even served up the evidence.